Hello everyone! Debbie here with you today to share a fun little travel album that I made with paper lunch bags. 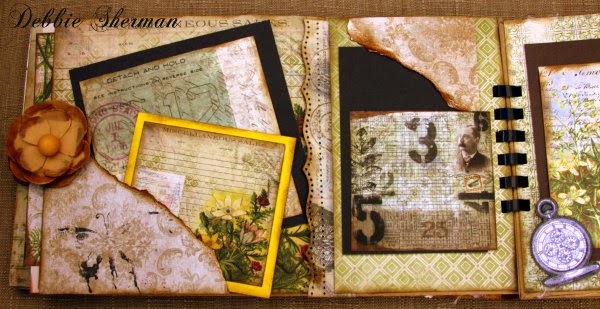 I used the Tim Holtz Paper Stash - Menagerie to create this fun eclectic album. We'll start with the cover. I made the cover using pieces of blank12x12 Chipboard from the EP store. I can't tell you how handy it is to have this blank chipboard on hand. I use it for so many different projects. It's a must have staple in my stash. I covered two pieces of chipboard with Tim Hotlz Menagerie papers and the embellished with Prima's Cartographer papers by fussy cutting ballons from the paper. I also added Prima Cartographer 12x12 Paper - Chipboard Self-Adhesive Pieces a few flowers and some embellishments from my stash. To hold the whole album together I created a fun faux leather binder that I made from Kraft paper, an embossing folder and Inka Gold in Copper color. Now for the inside of the album. This album was made by adhering paper bags together back to back leaving the flap to create pockets. It also leaves the paper bag itself open to insert tags or keepsakes. I will be using this album for a trip I took to Jackson, WY and to Idaho. 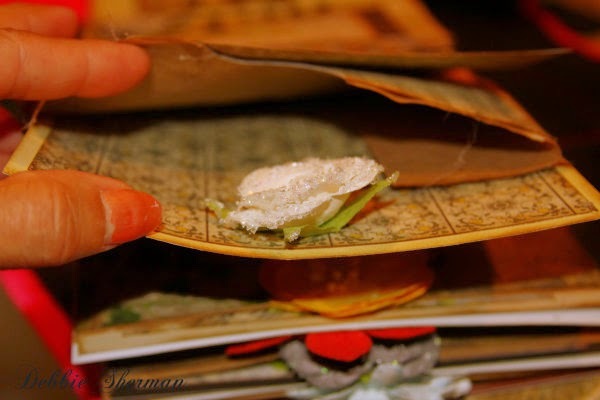 Here is what the inside of this album looks like. It's loaded with tags and pockets, lots of space to keep your souvenirs from your trip. You can insert these tags into the opening of the paper bag and use it for photos or journaling. opening of the paper bag...can be used for souvenirs. I hope you enjoyed this album. If there is any technique you would like to learn with this album please leave a comment and I'll be happy to help. 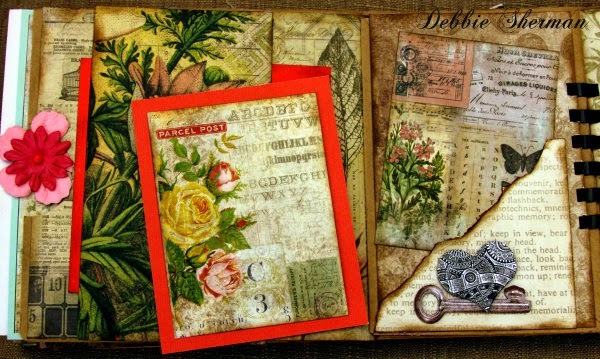 Thanks for stopping by the Eclectic Paperie blog today! Awesome album Debbie. Love all the pages and pockets. I would have never guessed that this beautiful album was made up of paper bags. Nice album and a lovely paper line. Fab album and Beautiful pages! 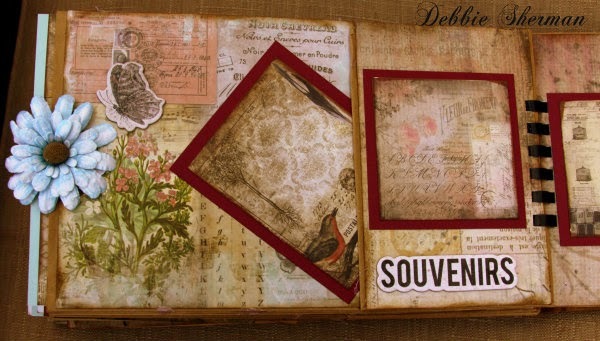 I love paper bag albums and yours is fabulous Debbie. Great choice of papers and elements! Debbie your album is just fabulous ! Gosh what a lot of terrific details you created for this project. I do admire the work and the finished result ! You are truly very talented !! I'm so happy that you shared your art with us, so nice to soak up inspiration from such skilled artists as you. 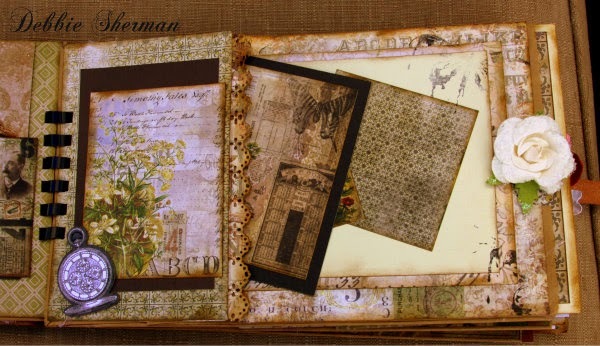 I love the idea of paper bag albums (especially all the pockets! ), but can never quite figure out how to actually make it. Any help/tutorial would be awesome!